Our finished chicken castle... the Coop (with a capital "C" – thank you very much). Made out of scrap wood and spare parts, it was one of the least expensive projects we've ever tackled. Sometimes it's easy to get overwhelmed when faced with animal housing. The time, expense, and the worry if it is actually right for your needs. We purchased several books which claimed to have animal housing plans. They did not. We felt cheated and discouraged. We could draw pictures of barns and chicken coops ourselves ... we decided to just wing it. Preflight was discouraging but our spirits recovered before landing. Josh and I made several trips to the massive wood pile on Post and found old Stryker parts boxes (translation: an infantry fighting vehicle whose parts require commercial kitchen refrigerator-size wooden boxes). We had no idea what we were going to do with the thing but we knew we were going to base our coop around its use. That's how scrap projects work -- you must plan and build to your supplies instead of building to plans. Not for the novice builder ... nope. Good thing I married a pro, huh? Actually, he isn't a professional builder ... he's a Ranger with a lot of good old fashioned common sense who is not afraid of a little hard work. And what did I do? Why, I took pictures, supplied iced tea, and acted as the designer for both the interior and exterior. While we will probably never be able to replicate this coop, our chickens love it and we are very proud of the silly thing. Everyone who comes to the house admires its functionality and good looks. The chickens love the roomy nesting boxes, doors along the back for ventilation and alternate exits (also for collecting eggs), and the log perch with its neat branch for the bantams. This design would not work for folks in the far north to winter their birds but for a Southerner interested in raising a small backyard flock … it rocks like KISS (or the Charlie Daniels Band, Alabama, or – insert a totally kickin’ band here – ). Please, tell us about your chickens, coop, or small-scale farming dreams. We want to know! There's a bar of soap for a lucky reader! Your comment is your entry! Congratulations, Applie! You won a tote bag commenting on the quark post! Please contact us with your mailing address! Scrap lumber made nesting boxes for laying hens. Here the coop is on its back. Josh added side boards to support the nesting boxes. We used an old parts container to make panels. 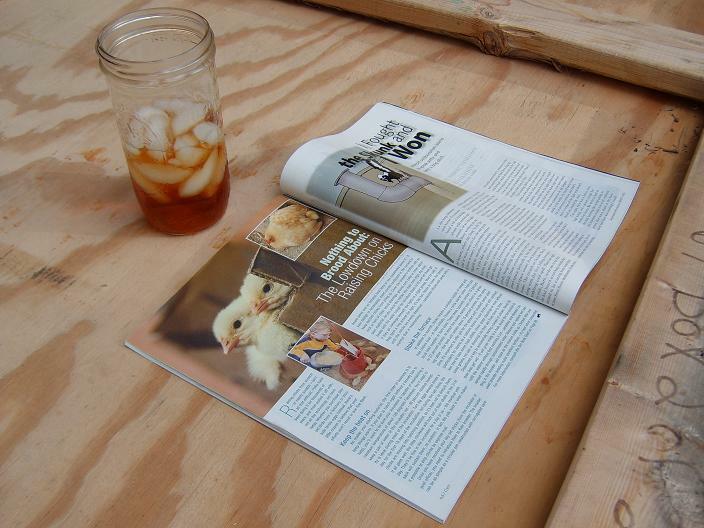 Sweet tea & GRIT Magazine: two items that make farm projects enjoyable! The boxes and floor are lined made with chicken wire and stapled into a frame. This is an easy solution to a perch ... a branch that fell doen in a storm -- trimmed to fit. Doors to Nesting Boxes Easy to make and VERY useful! A large door on both ends makes for easy cleaning and viewing. We like the red barn look -- cheerful. Be warned: paint is not cheap. Painting turned out to be the most expensive part of the project. Don't forget to stop in and visit the Razor Family Farms Web site. Oh yeah! The projects that re-use are the best! Some real creativity involved... Your man is a keeper! He's ALMOST as good as mine! =P LOL! We constructed a coop from pvc pipe, chicken wire, a tarp, a bit of wood and bungies. It is, I guess, a chicken tractor. It is portable. We move it every day. They always have new ground to scrounge. And the "lawn" has a chance to recover. Living in Canada, and quite far north, our coop for the layers had to be insulated. I had a calf shelter built and a front put on it that had window spaces for windows we got from friends who replaced their home windows. I built an interior wall to provide a space for feed and tack, then used stair runners to put the cut tree rungs for the roost. There is a dirt floor with shavings, the idea is the stuff will layer and compost. The nests will be done soon and the bottoms are made from contractors sidewalks turned up and divided and will be mounted from the ceiling. Now that we have this building (on skids) we will build another smaller one. It will be a donkey shelter this winter as was the first one, then in spring, it will be insulated and fixed up to house the new chickens while the older ones remain where they are. We will do the same next fall, having 3 coops in total, and then the final one the following fall will be the donkey's final shelter. Or that is the plan anyway. Great job, Lacy. The Coop de Ville; the Cadillac of chicken coops. And it's so pretty; I love red. "We had no idea what we were going to do with the thing.... That's how scrap projects work -- you must plan and build to your supplies instead of building to plans." You took the words right outta my blog...the one I'm planning on writing in a couple of weeks, or whenever I get around to it. It comes right after the one I'm planning on writing for this week....or whenever I get around to it. Time: There never seems to be enough of it; wouldn't it be cool if you could take a wooden crate, some chicken wire, and a fallen log, and fashion from them an endless supply of spare time? Red paint is optional.